“Main aap se Badla lene aa raha hoon @SrBachchan saab! Taiyaar rahiyega... (I am coming to take revenge on you. Be ready),” he wrote in a tweet to tease the poster. He followed the tweet with another, sharing two posters from the film. “Ab mahaul kuch Badla Badla sa lag raha hai. 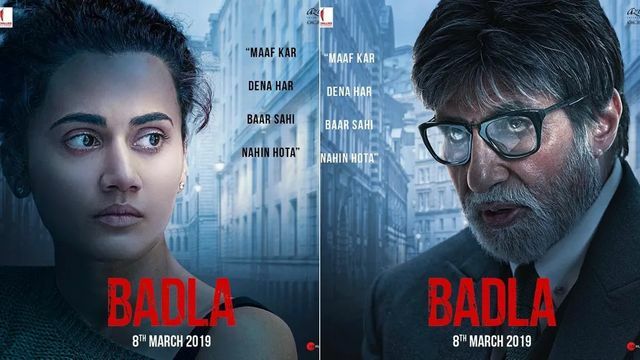 Here’s the first look of Badla featuring @SrBachchan and @taapsee ! Directed by @sujoy_g. #BadlaTrailerTomorrow,” he wrote. Amitabh also shared the posters on Twitter. “Arey bhai @iamsrk, Badla lene ka time toh nikal gaya .. Ab toh sab ko Badla dene ka time hai. (Brother, the time to take revenge is past us. It is now time to give revenge,” he wrote in a tweet. Badla is reportedly a remake of 2016 Spanish film, The Invisible Guest. It is the director-actor duo’s third collaboration, after Aladin, and TE3N, which Sujoy produced.“I am very excited about this film. People wait to work with him and I got to work with him twice in two years. It gives me lot of excitement and I hope the magic gets repeated. When people say, Bachchan sir and I are a hit pair, it excites me,” Taapsee told PTI about their collaboration in Badla.